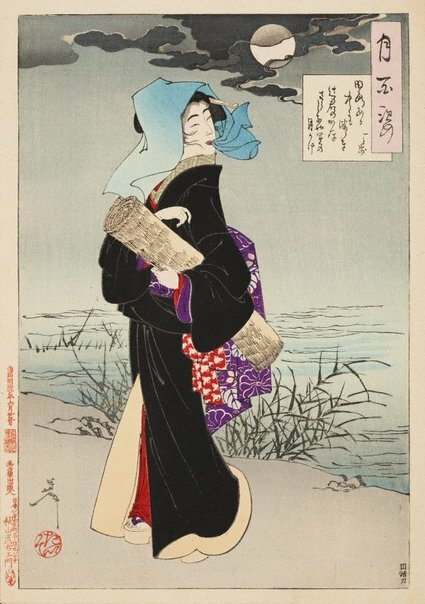 The young woman depicted here is a 'tsujigimi', literally 'mistress of the street corner'. Belonging to the lowest class of prostitutes, 'tsujigimi' had to roam the streets, carrying a straw-mat under their arm, ready to be rolled out on demand. Unlike the young woman shown in this print, 'tsujigimi' were usually old and used heavy white make-up to cover their blemishes. The poem in the title cartouche by the female poet Oshun Hitotose refers to the extreme whiteness of this make-up that reflects the moonlight.